‘There is no mention of Hanuman made anywhere in Vedic literature. Researchers feel that “Hanumant” must be the Sanskrut form of a Tamil word. 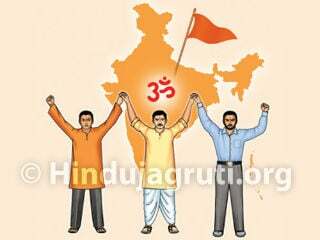 When translating Dravidian words into Sanskrut there is a practice of mostly prefixing the alphabet “h” to the word, for instance Idumbika (proud woman) becomes Hidimba, so also Anmandi (an meaning monkey and mandi meaning man) when translated to Sanskrut becomes Hanuman. 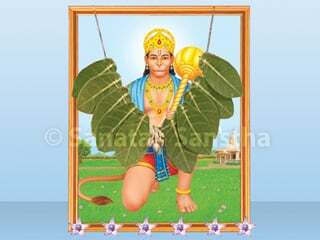 Hanuman is also known as “Anumandan” in South India. This implies that “h” from the Sanskrut word has been omitted here.’ The story behind the birth of Hanuman is given in Valmiki Ramayan (Kishkindhakand, sarga 66) as follows: Anjani gave birth to Hanuman. After birth, thinking that the rising sun was a golden fruit He leapt into the sky for it. That day being a solar eclipse (parvatithi) Rahu (the dragon’s head) had come to engulf the sun. Thinking that Hanuman was another Rahu Lord Indra attacked Him with His thunderbolt. It struck Hanuman’s chin (hanuvati) which got cut and developed a cleft. Thus he acquired the name Hanuman. In a way Maruti also becomes Rama’s brother because along with the queens of King Dasharath, Anjani who was also performing austerities received the sweet (payas) from the sacrificial fire (yadnya) and it was because of this that Maruti was born. 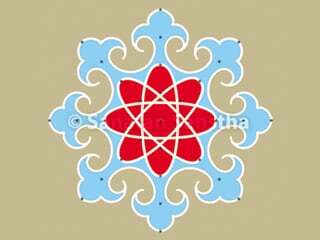 It was the full moon (pournima) day of the Hindu lunar month of Chaitra. 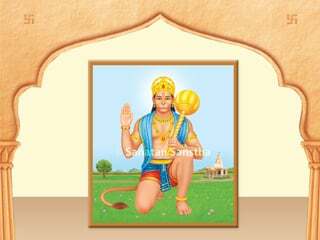 This is celebrated as the birthday of Hanuman (Hanuman jayanti). ‘Hanumant is also known as Maruti. In the Mahabharat He is referred to as Marutatmaja. The word Maruti has originated from the word Marut. There are many schools of thought regarding Maruti and Rudra. ‘There are eleven rudras. Since Hanuman too is a rudra He is included in these eleven. 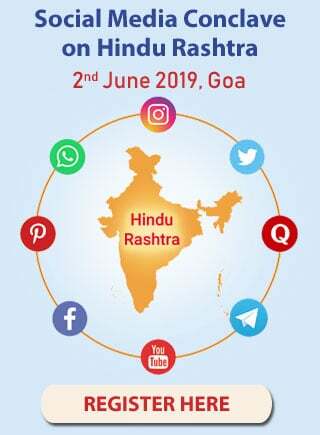 Bhim is one of the Names of the eleven rudras. Hanuman has also been referred to as “Bhimrupi Maharudra”. It is believed that probably Hanumant’s five faced idols have been derived due to the influence of the five-faced idol of Rudrashiva. 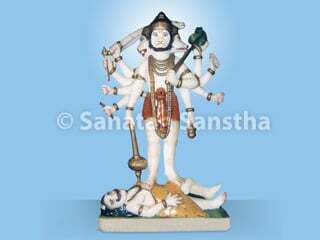 Among all deities only Maruti cannot be troubled by distressing energies. In Lanka there were lakhs of demons yet they could not do anything to Maruti. There is a tale which says that Maruti leapt to devour the sun as soon as He was born. From this it is obvious that Maruti, son of Vayu [generated from vayu (absolute air)] was one who could win over the sun [tej (absolute fire) element]. Of the pruthvi (absolute earth), apa (absolute water), tej (absolute fire), vayu (absolute air) and akash (absolute ether) elements the vayu element is the most subtle and therefore more powerful than the tej element. Spirits and Maruti: Maruti is considered as the master of spirits. Hence when someone is possessed by a spirit he is taken to Hanuman’s temple or verses (stotras) of Maruti are recited. Even today the best example to illustrate devotion as a servant (dasyabhakti) is that of Maruti towards Rama. He was ever-ready to sacrifice even His life for the sake of His Lord. Before the service of His Lord even attainment of Liberation (Moksha) was worthless to Him. 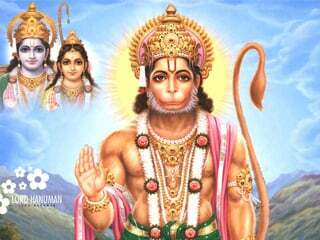 Hanuman is a combination of a servitor and a soldier! As the battle continued Maruti would sit aside and meditate for sometime. However even at that time He would remain alert, with His tail resting on His mace. ‘None could match Maruti in grammar rules, as an instructor and director, an envoy, a commentator and a compiler.’ (Uttarramacharita, 36.44-46) Maruti is referred to as the eleventh proponent of grammar. In many instances not only Sugriva, the king of monkeys but even Rama has heeded Maruti’s advice. When several lieutenants opposed the move of giving refuge to Bibhishan who had deserted Ravan’s army camp, Maruti was the only one who opined that he should be taken onto their side and Rama accepted His counsel. His intelligence and expertise in psychology is clearly illustrated in several instances like when He generated trust in Sita at Their very first meeting in Lanka, His setting Lanka ablaze to demoralise the enemy camp; His being chosen by Rama to see Bharat’s response to Rama’s arrival, etc. Hanuman’s mental state when in search of Sita in Ravan’s haven illustrates His noble character. At that time He says to Himself “Although I saw Ravan’s wives lying about carefree, I was not at all tempted by lust.” – Valmiki Ramayan, Sundarkand 11.42- 43. Several saints too have ritualistically worshipped this Hanuman who had mastery over His senses and placed Him as an icon before society. Maruti is considered a prominent founder of music. His connection with Rudra is probably the reason why He is called so. Rudra is a form of Lord Shiva. Since sound originated from Shiva’s small hourglass shaped drum (Damaru) Shiva is thought to be the founder of music. It is only after realising the musical talent in Maruti that Samarth Ramdas Swami conferred the title ‘Sangitdnyanmahanta’ meaning the great knower of music, upon Him. 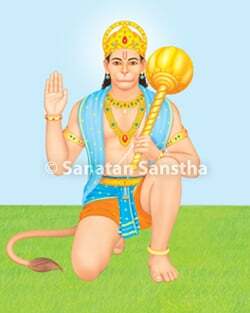 The Nath sect has twelve sub-sects and Hanuman is considered to be the founder of the Dhvajanath sect among them. The followers of this sect are devotees of Hanuman. Even today several men and women circumambulate Hanuman’s idol daily as a vowed observance due to the belief that this deity responds to one’s vows. Some people find it amazing that girls whose marriages do not materialise are advised to worship the celibate Hanuman. Based on psychology some erroneously jump to the conclusion that girls who wish to marry a robust man worship Maruti. However the real reasons for the worship are as follows. Among deities of the highest level there are no differences between celibates and married ones. Also since they are born by a mere resolve (not born through the vaginal route) there are no gender differences among them. These differences are created by man. A female deity is but a representation of a deity’s energy. Each time Lord Rama incarnates He is one and the same but in each incarnation Maruti is different. Although He is one of the seven immortal beings (saptachiranjivas) these beings attain the Final Liberation (Moksha) at the end of the four eras (yugs). They are then replaced by seven very highly evolved beings. The meaning of these words is given in ‘Principle, ability and manifest energy’. Principle: Vishnu principle 70%, Shiva principle 10% (Vishnu / Shiva / God = 100% principle). Although Maruti is an incarnation of Lord Shiva due to worship of Lord Rama the Vishnu principle in Him is greater than the Shiva principle. Ability: Creation 10%, sustenance 70% and dissolution 20%. Eleven Laghurudrās amount to one Mahārudra.